Seven years ago today, Tokyo Disneyland opened up "Pooh's Honey Hut" and became the most popular ride in the park. Many of you have heard me talk about this ride and yes, it is as amazing as I say it is. While Disneyland got "The Many Adventures of Winnie the Pooh" a few years later... the 30 million they spent on ours really does become painfully evident when you get a look at the Japanese version. Even worse when you ride it, considering the concepts for this were from the original blue sky phase for the ride we were supposed to get state-side. Once you leave the ride, you'll dislike Michael Eisner even more knowing what we were robbed of. 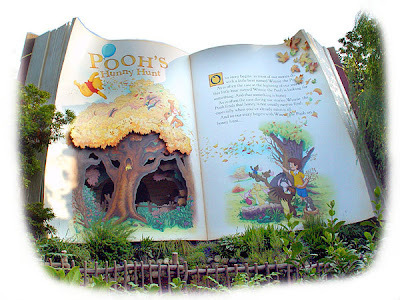 I agree that Pooh at Tokyo Disneyland is probably the best ride ever done. I rode it so many times and each time was better. Aquatopia at Disney Sea was similarly fun. The fact the vehicles in both are "independent" gives a great ride experience. Your are just not sure where they might go next. It shows you that when money is no object what can be done. Problably will not happen over here as it would set the "bar" too high for any rides that might use a track. Just a thought and a concept I have thought about. Imagine if you will.. Journey into Imagination with the original ride plussed up and including the Pooh ride system. I'd even through in the twirling party room from Pooh as(Figment's Birthday). Shh..don't tell cause Tony will steal it and call it his own. All for now RWR. Anonymous, your Tony Baxter-bashing is getting annoying. Could you please stop it.